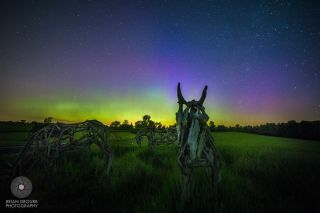 Astrophotographer Brian Drourr took this amazing photo of the northern lights on June 8, 2014 from Champlain Valley, Vermont. This gorgeous image of a springtime aurora was captured in northern Vermont. Astrophotographer Brian Drourr took this image on June 8, 2014 from Champlain Valley, Vermont. Drourr was attempting to take an image of the foreground, what he thought was a pack of horses.